You might be surprised to know that skin is the largest organ in human body. It is a kind of sheath that separates us from the outer environment. It protects our internal organs from getting exposed to the harsh climatic condition pravelling outside. Any problem in skin or any kind of infection to the skin can causes threat to the internal organs. It helps in keeping our vital organ from hanging outside the body getting infected very easily. It also helps in maintaing body temperature. More importantly it helps us in perceiving sensation of touch. According to modern sciences skin is made up of three layers. Named epidermis the outer layer, dermis the middle layer and subcutaneous fat the inner layer. Ayurveda believes that skin has six layers. Epidermis is the outer most layer of the skin and is the part of the skin, which is visible with our normal eyes. This layer of skin keeps on producing new cells, as 30000 to 40000 cells are lost every minute. It contains a very important content name melalin that is a very talked about things now a days. Melalin imparts colour to our skin. More the melalin content darker is the complexion. Actually melanin is a protective device of your skin that helps you to protect from sunburns and very harmful ultraviolet rays or more commonly called UV rays. This is the reason tanning occurs in people who get exposed to sun. But melalin production is not enough to give all round protection to protect skin from dehydration and cancerous cell production. Important thing about epidermis is that it is composed of dead cells hence is non vascular i.e. it does not have blood supply and nervous supply. Second is the dermis layer that lies below the epidermis. As it is beneath the epidermis hence dermis is not visible. Dermis serves very important function in the protective and perceptive role that skin plays. It serves many functions, as it possesses nerves ending, vascular supplies and glands (both oil or sebaceous glands and sweat glands). Due to presence of these factors we can perceive the touch sensation. Vascularity to the skin initiates in dermis and hence helps in providing proper nourishment to the skin cells. Dermis also contains sebaceous glands or more commonly called oil gland, which helps our skin in lubrication thus helping it from catching any infection. It makes our skin work as raincoats therefore help skin from getting sogged and swelled away in water. Sweat glands play a very important role in our life. Most important of all is that it helps in maintaing our body temperature; secondly it plays an excretory role by excreting out harmful toxins that might have formed in our body; thirdly it helps in protecting our body from microorganism as it possess antibacterial properties. Third and the most important of all the layers is the subcutaneous fatty layer. Its role is to work as a shock absorber in he body and to maintain body heat from getting transferred to outside temperature. It also helps in holding internal organs tightly as it is present beneath the skin. This also contains a very peculiar feature that only mammals possess i.e. hair follicles. This layer is full of hair follicles out of which hair grows out. Nourishment of hairs depends upon the sebaceous glands, which opens into the hair follicle thus proving it with shine and nutrients. It is really very essential to know the kind of skin you possess, as right care of skin can help in reducing any skin problems and avoid diseases. 2. Dry skin: Skin is said to be dry, when skin is dull, patchy, reddened and flaky especially around eyes. Dry skin may cause formation of fine lines on cheeks, under eyes and corners of mouth. These conditions happen when oil or sebaceous glands are not supplying good nourishment and lubrication to the skin. If proper care is not given to the skin then it may lead to initiation of wrinkles in early age. 3. Oily or greasy skin: This kind of skin is thick, dull in colour and shiny in appearance. Due to over secretions of oils or sebum through oil gland, makes skin pores open and skin becomes sticky, which attracts dirt and dust from the environment. Due to this tendency, dirt and dust particles blocks the skin pores which are already widely open in oily skin leads to problems like black head, white head, acne and other skin related problems. 4. Combination skin: Commonly seen skin texture which is the combination of two kind of skin i.e. some of the skin area is dry and some of the area is oily. Usually it follows the pattern of "T" i.e. the greasy part is usually the portion which is vertical to nose crossing nose (nose, mouth and chin) and horizontal on fore head and hence referred to as "T-Zone". The area left i.e. cheeks is comparatively dry. 5. Sensitive skin: This kind of skin is very sensitive to any change in environmental conditions or any kind allergies, which may be caused due to procedures like bleaching, makeup's and other external applications. It is a very simple method to know that what kind of skin you possess by following procedure mentioned below. Whenever you wake up in morning, wipe your face with dry tissue soon after leaving your bed. If you find oil on that tissue, you possess oily or greasy skin. If you find grease on the center panel then you possess combination skin. If there is no grease at all then you either have dry or normal skin. 1. Firstly disease caused directly to skin from external source. 2. Secondly disease caused due to systemic disorders. 3. Thirdly it may represent mere symptom of another disease. In this skin is the mere face that represents the symptom of any disease prevailing in the body. For example loosening of skin, which might be caused by dehydration. How to make skin to happy so that it may remain healthy and glows with shine. 7. Use of good skin cleansers and toners regularly to open up blocked pores. 9. Eat healthy food and avoid junk food. Inspite following these measures if you are not able to achieve the healthy and good skin then you must read below. 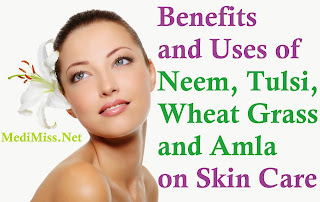 · Neem is a wonder herb. 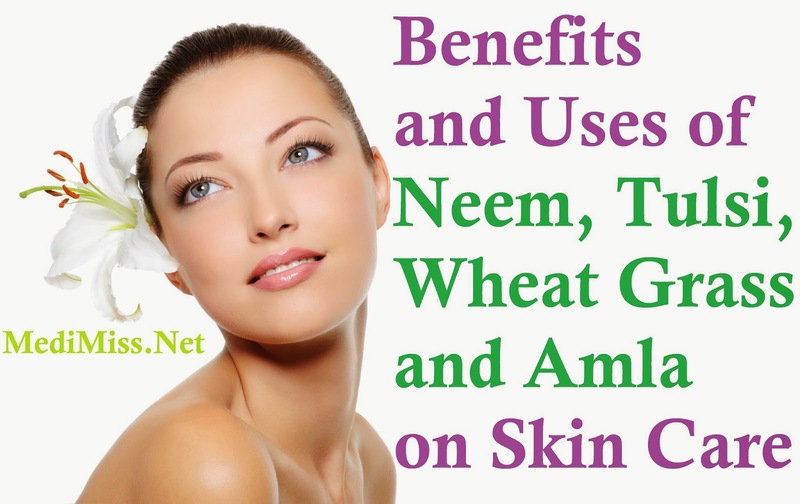 Since early times neem is known for its wonderful properties and marvelous results on skin. It works as blood purifier and is very helpful in eradicating toxins from the blood that are supposed to cause harm to the skin. · Neem is extensively used in hair fall and early graying of hairs with very satisfying results.